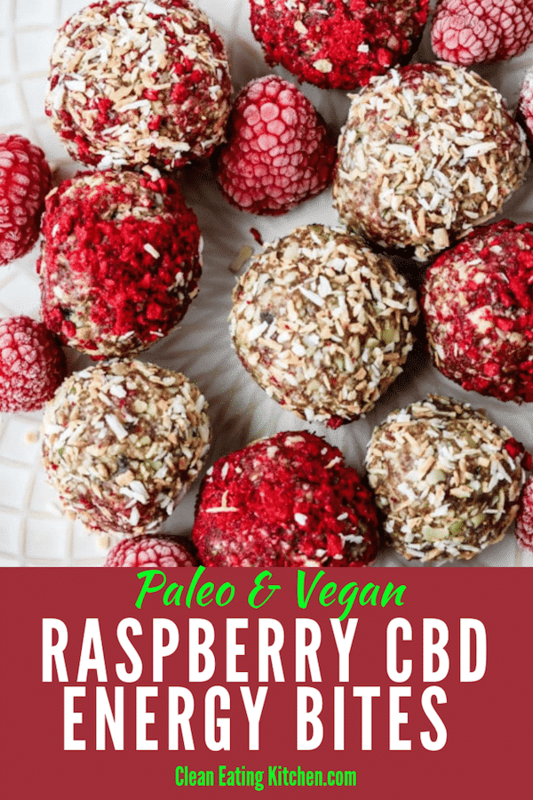 Coconut and raspberries go great together in this delicious these Coconut Raspberry CBD Energy Bites. This recipe is gluten-free and grain-free. Energy bites are my #1 fav dessert to have in the house because they’re just sweet enough to count as a treat, but they’re not so decadent that I lose all control. I try to use dates to sweeten all my desserts – dates are a whole food with fiber and minerals and just don’t seem to have that addictive quality that refined sugars do. This is not the first time I’ve posted an energy bite recipe, but it is the first time I’ve paired coconut and raspberry together. The raspberry comes from that red powder you see; I made it by grinding up freeze-dried raspberries (you can also buy raspberry powder…who knew?). 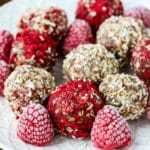 These Coconut Raspberry Energy Bites are so fun and tasty! I’d venture to say that energy bites count as a superfood depending on which ingredients you decide to use. I love using a mixture of hemp seeds and sprouted seeds for the base, and then adding coconut oil as the binder and dates to sweeten. From that simple recipe, there are countless possibilities to jazz them up or make them seasonal in flavor. As I mentioned, this is the first time I’ve used coconut and raspberries together, and they make a beautiful pairing. Raspberries might not be exactly seasonal right now, but let’s just say I’m gearing up for summer (it was over 85 degrees in California earlier this week and sure felt like summer). The last “special” ingredient for this recipe was the addition of CBD oil. I am enjoying the results I’ve gotten from using CBD regularly, including reduced anxiety, lower inflammation, and better sleep. 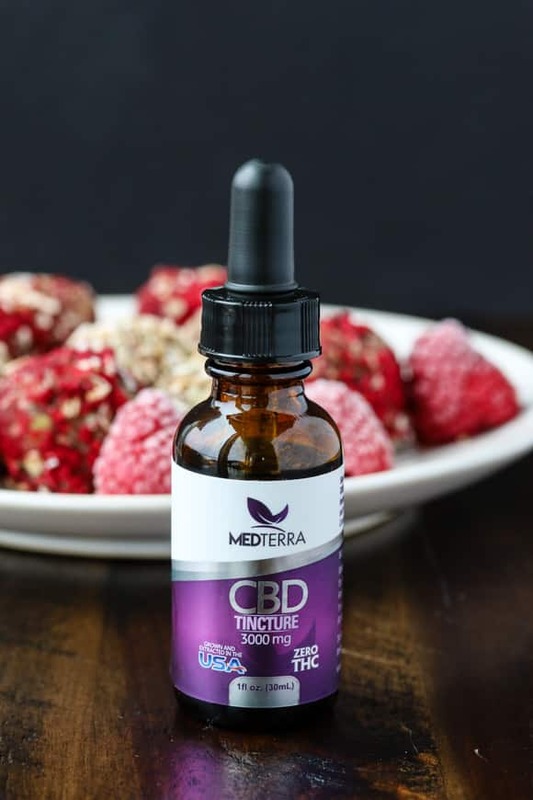 You can learn everything you need to know about using CBD for anxiety and inflammation, or listen to an interview about the basics and legality of using CBD I did with the CEO of Medterra. How Much CBD Oil to Use? If you’re not into CBD, no worries, just leave it out! It won’t make a difference to the texture or flavor either way. I used 1ml of the 3,000mg tincture which would result in 100mg of CBD for the entire batch of energy bites, or less than 10mg per serving. And, just in case you were wondering, you might want to hold off on giving any CBD products to children. There is some published literature on pediatric dosing, but more research is needed before I would feel comfortable making any recommendations. An easy CBD-infused dessert recipe that is grain-free and gluten-free. Pour the contents of the freeze-dried raspberries into the base of a food processor. Turn on high until the raspberries are ground up into a fine powder, about 20 seconds. Pour the raspberry powder onto a plate and set aside. 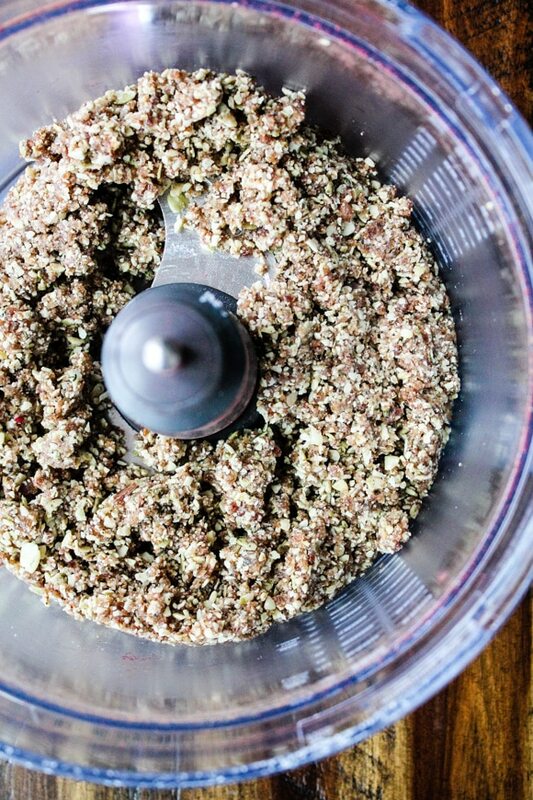 Next, combine the pumpkin seeds, hemp seeds, dates, coconut powder, coconut oil, and CBD oil into the base of your food processor. Process on high until the ingredients have turned into a coarse batter, about 60 seconds. Pour the mixture into a mixing bowl and use your hands to shape the batter into 12 energy bites, rolling each one in the raspberry powder as a coating. Refrigerate the energy bites for at least 30 minutes before serving. Store in the refrigerator and consume within 7 days of making. Leave out the CBD oil if you prefer. If you want to purchase products from Medterra, be sure to use code CLEANEATING during checkout to save 20%! Chocolate raspberry is my fave. I love anything orange/chocolate! It’s an unusual combination, but the blend of the tanginess of the orange and the nuttiness of the chocolate is perfection. I like lemon ginger flavors. Your recipe is so colorful and looks so festive! My favorite dessert flavor is strawberry and white chocolate. Strawberry and chocolate is my favorite flavor combination. I like lemon and vanilla in desserts, especially for spring! I love chocolate and raspberry. Chocolate and strawberry are my favorite. So curious about CBD in general and would love to try! It’s impossible to pick one favorite flavor combination, but mint chocolate is always near the top of my list. Anything chocolate and I’m all over it! My fave combo is strawberry-banana though. CBD has been coming up in conversations lately — ironically, around treating separation anxiety in fur kids — so I’m off to read your linked article on your personal experiences with CBD. Many thanks, Carrie! I love chocolate with strawberries! Lemon New York cheesecake is one of my favorite flavors of desserts. Sounds delicious! I really want to start incorporting CBD into my recipies too. Love a strawberry and chocolate combination. Mmm! Peanut Butter & Chocolate is my favorite combo. I love raspberry. And I found this recipe very practical, it seems to be very delicious. I love desserts with almond paste or chocolate and peanut butter combination. This sounds so good! I’m trying to eat cleaner and these would be perfect for when I have a sweet craving! Thanks! I love coconut. My husband just started taking CBD oil so I look forward to making these for him! Dark Chocolate and Coconut is my favorite combo! Now this sounds like an interesting recipe, great for those who use CBD oil and of course those who need a pick me up too! Strawberry and coconut blend perfect together! Looks so tasty!! I love lemon and pineapple. I go through stages and right now i really obsessed with pineapple everything! I remember we still have some dates at home. I would try to use them to sweeten the baked goodies we make next time. This is the first time I’ve read about CBD. It’s an interesting product. I love an easy recipe that doesn’t require too much. These look so delightful. I love the flavor combination of these energy bites. My niece would love this for sure. yummy!!! I could really use some energy bites this week. I’ve bought energy products before but didn’t realize I could make something like this. Now this is a really cool snack idea! Raspberry is probably my favorite fruit. I would love to make these sometime! They look really good and healthy! Coconut and Raspberry are perfect match for deserts. I would love to try this at home. Chocolate and strawberry – yum! These treats look absolutely amazing. And healthy! Wow!These look not only tasty but sound super healthy as well. We love energy bites and they are so simple to throw together. Wonderful thing is you can add whatever your family likes plus good for them.. Cranberry is a favorite for us. I love energy bites! I only have one recipe that we have tried before, but I love the idea of adding fruit to them. And the color is so pretty! Yay! I love raspberries. will try this for my younger brother and sister. they will surely love this. So beautiful! What a yummy and healthy treat. These energy bites look like they taste amazing. I love coconut and raspberry so these are awesome! This is not only healthy but also looks great! What a great idea for a healthy dessert! These are so pretty. 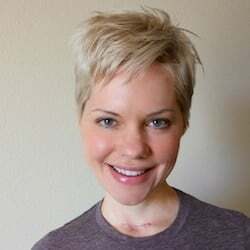 I’m so glad for you, for how the CBD oil is helping you to feel better! Big CBD fan here. Currently looking into using it for my 12yo daughter who struggles with forgetfulness a lot. These treats look super yummy, too! These are beyond beautiful! Will keep an eye out for freeze dried raspberries. These are so pretty, love all of that raspberry goodness with the hint of chocolate. Dates are always my favorite part in little bites like this, I love that these are filled with them. These sound amazing! I’ve been wanting to try CBD oil and this recipe may push me into purchase a bottle! These are beautiful! And what a great combination of ingredients! They must be very good. We have using CBD with my daughter’s anxiety/ADD…it is great stuff! I love that you used them in the energy bites! This is an interesting recipe! Good thing I can omit the CBD oil, looks so delicious! Raspberry is just one of my fave flavours, so these sound both healthy and tasty too. Coconut and raspberry are two of my favorite flavors, so you had me at the beginning. But combining it with CBD is genius, especially for those of us with chronic pain due to serious health issues. I can’t wait to try these out. Any ideas on what I could sub out for the dates, since they are too high in carbs and sugar for me. I love the coconut/raspberry combo! So delicious! 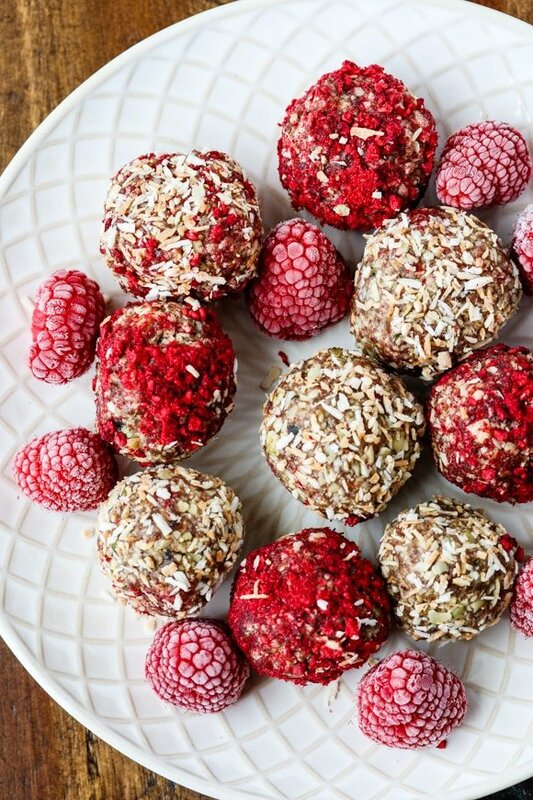 Chocolate protein bites are a favorite in our house… your raspberry version looks delish! These look like such a great snack. I wonder if CBD oil is available in Canada – I’ll have to check. I love the idea of using CBD for anxiety, sleep and other chronic ailments. It’s great to see more recipes using it. Chocolate and raspberry are one of my favourite pairings! I love that they have so much protein! Just bookmarked this recipe! They sound like the perfect snack!